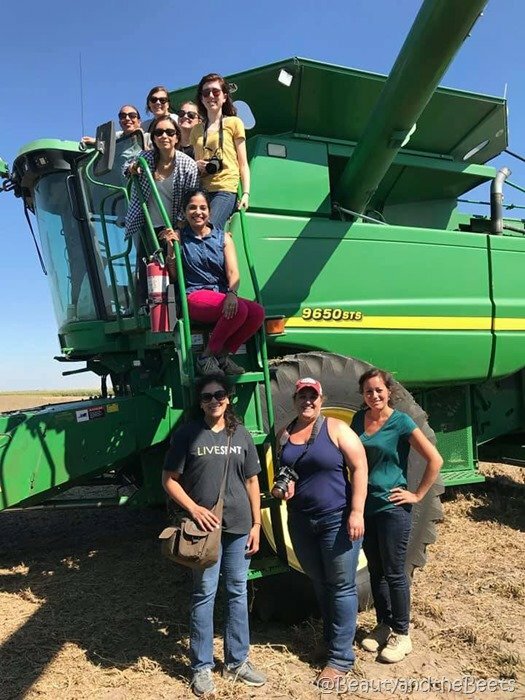 Last month I had an amazing opportunity to travel to Kansas and learn about farming, something foreign to this city girl. 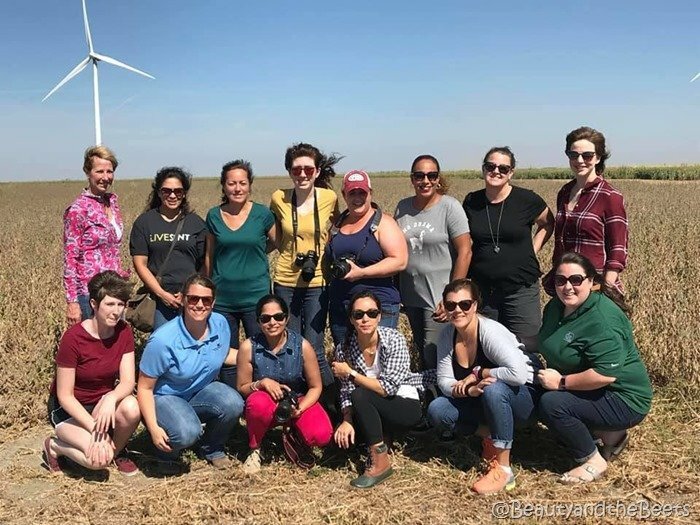 The Kansas Farm Bureau and Kansas Soybean Commission flew 8 bloggers to Kansas City, Missouri where our #FarmFoodTour began. We boarded a mini luxury bus, along with our two hosts, a local Kansas farmer, a dietician from Kansas State University, and a 2-person film crew, who were documenting our three-day adventure. I have to begin by saying, as someone who eats mostly Vegetarian, I wasn’t sure what to expect. Especially as I am not at all familiar with farming – whether it be animals or plants. Our first stop on our #FarmFoodTour was 150 miles west into the state of Kansas where we met Craig and Amy Good at their pig farm, where they have been since 1981. We met some very large boar, and got up close with some newborn baby pigs. 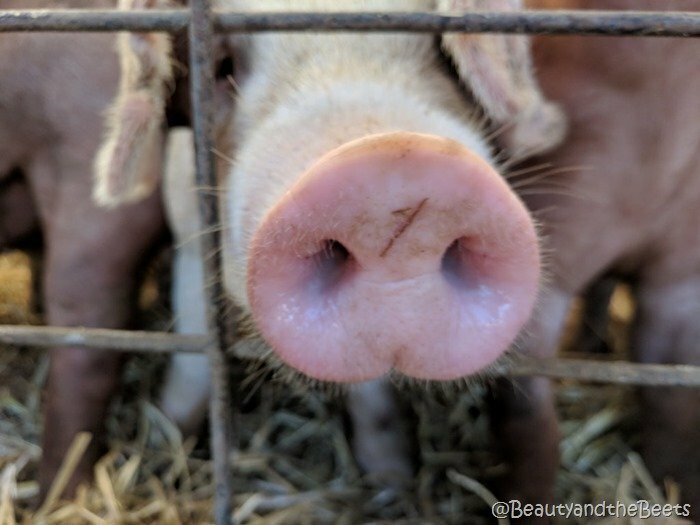 I learned the differences between a boar (an uncastrated male pig), a barrow (a castrated male pig), a gilt (a young female who has not given birth to a litter), and a sow (female pig). Their pigs eat a diet of soybeans, corn, and seaweed with some added vitamins and minerals. Their rations change throughout the different stages of their life. It was here on the farm that we enjoyed our first meal of the trip, catered by Little Apple Brewery from Manhattan, Kansas. We enjoyed Spotted Gloucestershire Pork Tenderloin, Braised Pork Shank, and house made Currywurst. 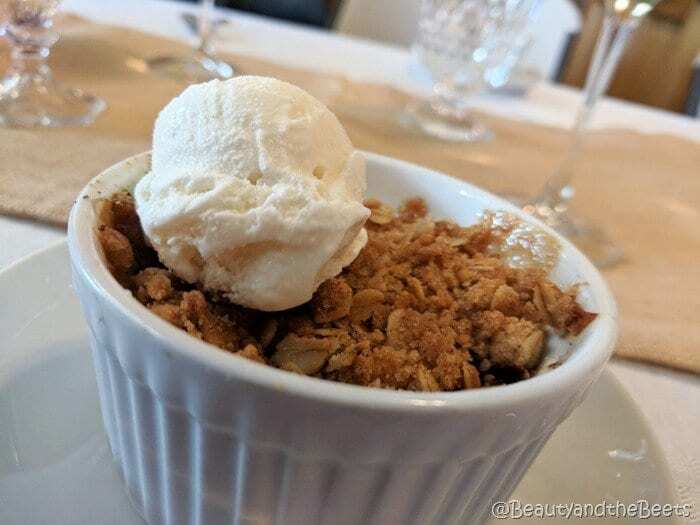 Dessert was Apple Crisp with Vanilla ice cream. 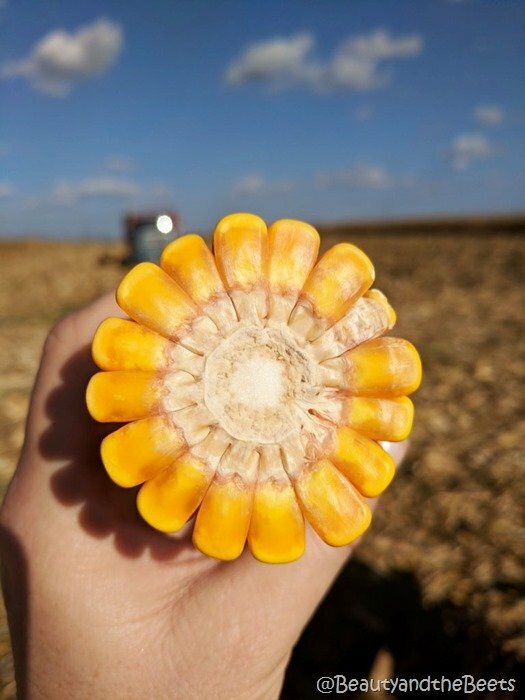 Off to our next stop in McPherson, KS – we visited Derek and Katie Sawyer’s farm. Have you ever flown across the farmland in the Central United States and noticed the giant circles on the land? Those are made by a Circular Irrigation Pivot, a machine that waters crops. We also watched a Combine Harvester machine in action. 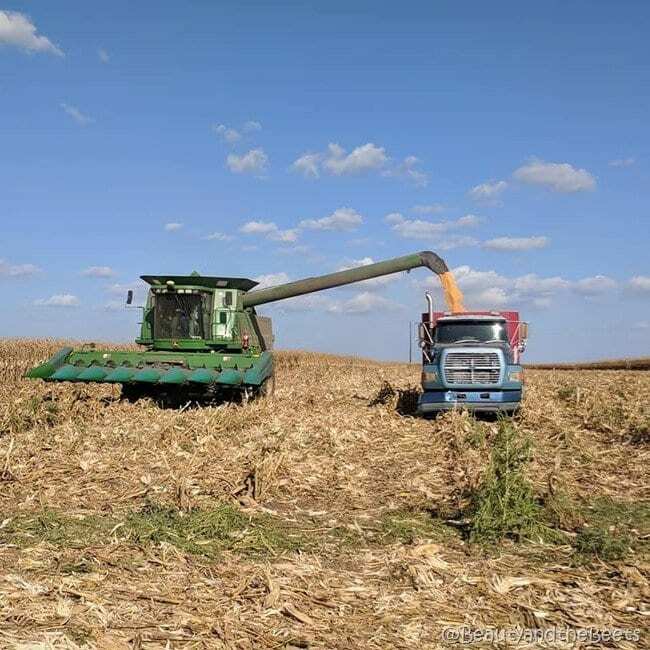 A Combine can harvest 12,000 bushels of corn an hour, or 12 truckloads. I also learned that a single e-coli breakout can be caused by a singular bacterium the size of the top of a straight pin. That’s all it takes to wipe out an entire season of crops across the state and the country. And that can be devastating to the farming industry as most Farmers live season to season. 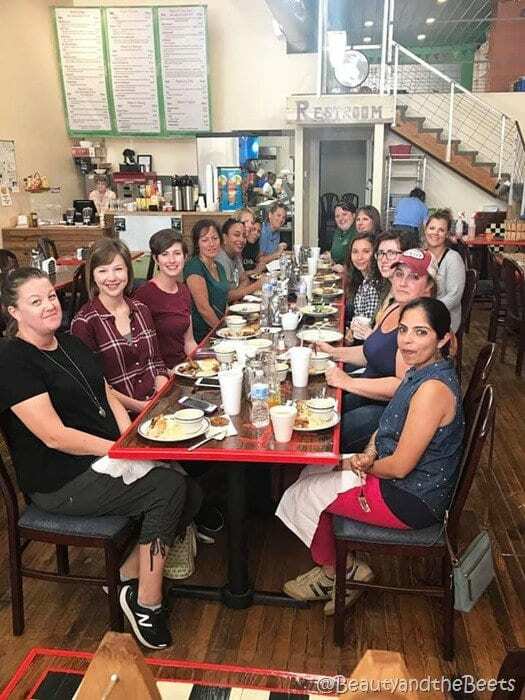 We settled into McPherson for the evening where we enjoyed our first dinner at Courtyard on Main, a restaurant that is open only for private events and parties. 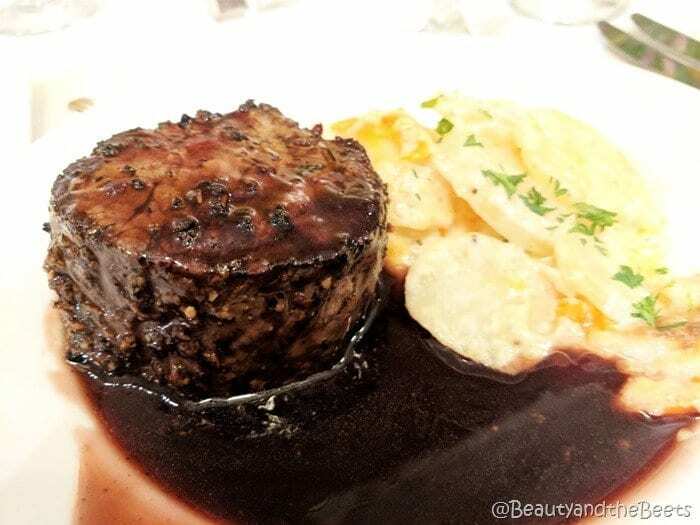 I loved the apple and blue cheese salad, along with a peppercorn filet mignon, and a berry parfait for dessert. Day two of our #FarmFoodtTour lead us 200 miles further west into the high plains of Kansas. We first stopped at Amy and Clint France’s farm in Marienthal. Amy France was actually the farmer on our three-day tour with us. She lives in Western Kansas with her husband and children where they grow grain sorghum, soybeans, wheat, and corn. They also raise Black Angus cattle and have a flock of chickens. 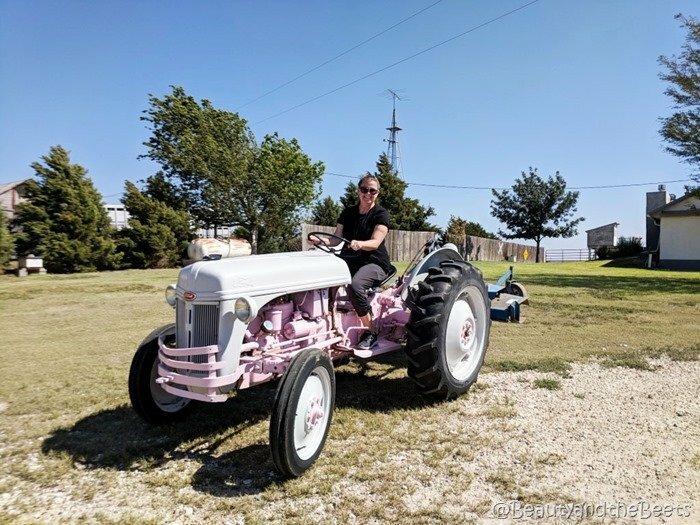 Amy brought out her pink tractor (she named the tractor Gretchen) and allowed us to feed the chickens. We also visited one of her soybean fields. 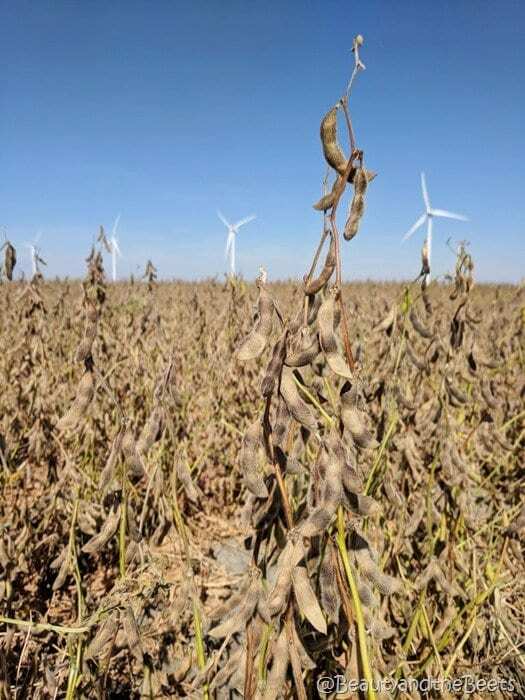 While I have seen soybeans in the field before, it was interesting learning that soybeans are primarily harvested for either meal fed to chickens, pigs, beef and dairy cattle; or oil which is used industrially. And here I thought soybeans were only grown to end up as my edamame appetizer at a Japanese restaurant. (Turns out edamame, while also a soybean, are grown mostly in Asia). 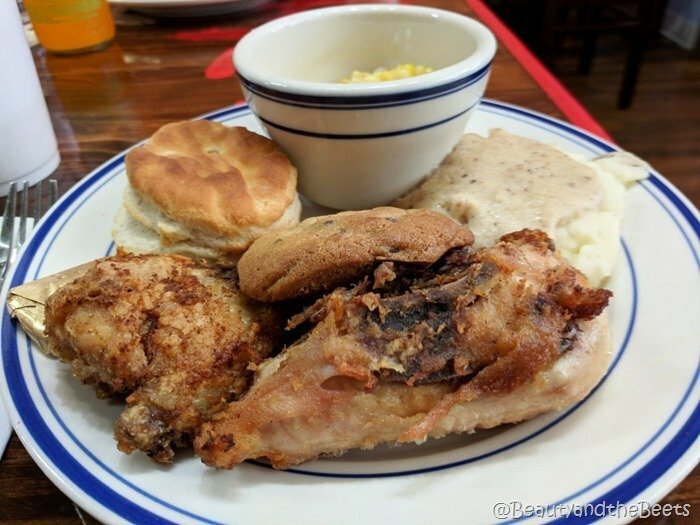 We were then treated to lunch at Law’s Feed Store in the small town Leoti, where the specialty is fried chicken. 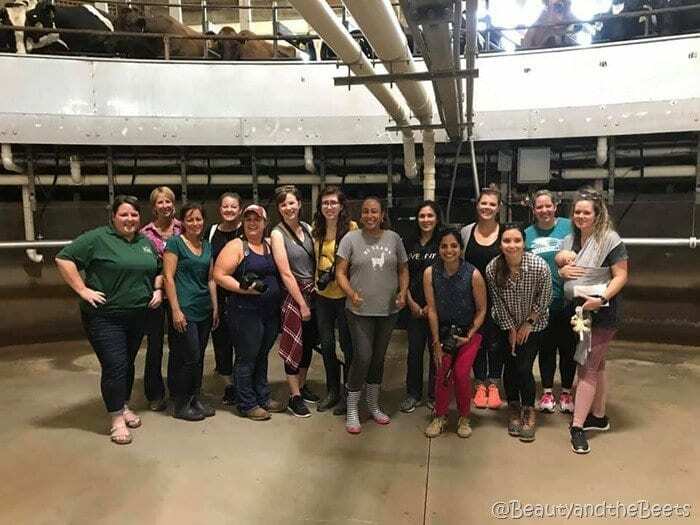 Next our #FarmFoodTour visited a feedlot in Garden City, where we learned about the differences between grass fed, grass finished, and grain finished. Do you know what this means? 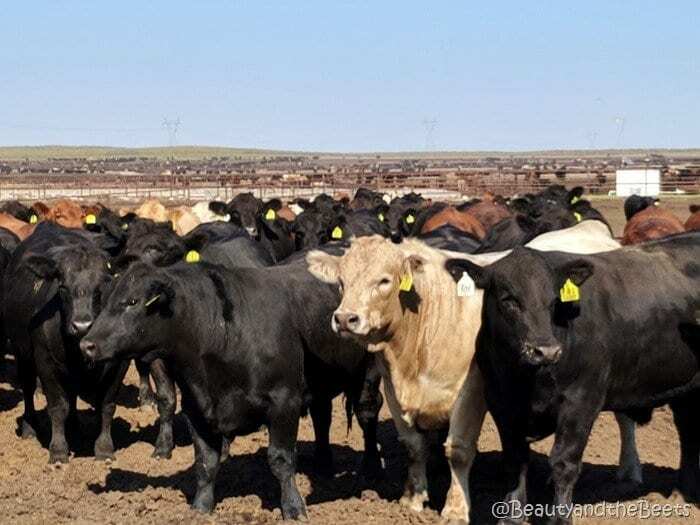 All cattle is grass fed – the label grass fed is simply a marketing gimmick, what is important is how the beef is finished, or what the cattle eat in the last 4 months of their lives. While grass fed seems to be more desirable, grain finished is actually more desirable in high end steakhouses as the grain lends to more marbling and a better taste in general. Our last stop of the day was at Forget-Me-Not Farms, one of my favorite stops. 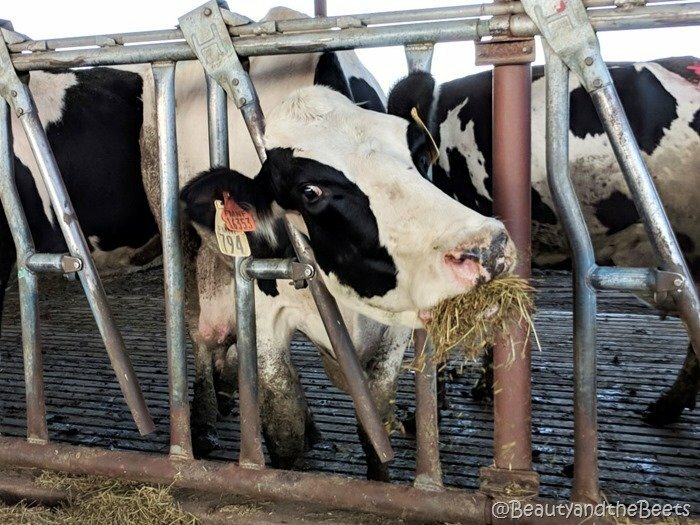 I have never visited a dairy farm before and it was fascinating. There are 72 cows that are milked at a time on a rotating milking wheel. 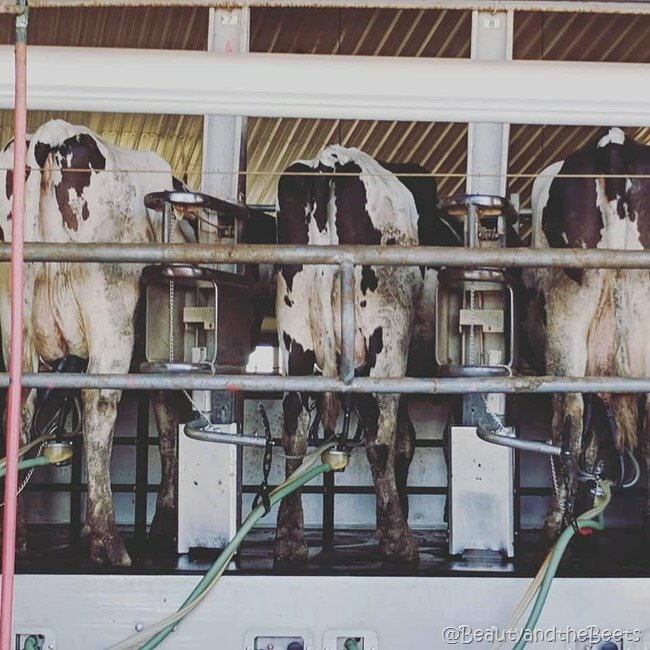 Each cow rotates on the large wheel for about 5-6 minutes at a time, and are limited to milking only 2-3 times a day. 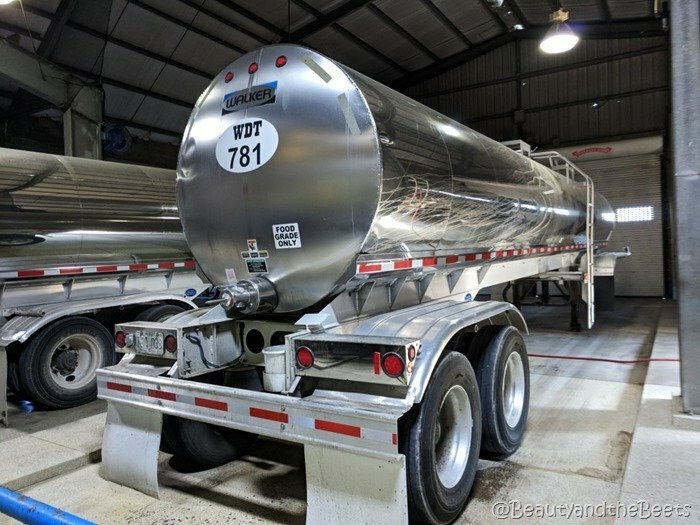 The farm can produce 8 gallon of milk per day per cow and the milk is loaded straight from the utter to one of 10 trucks a day, with each truck holding about 55,000 lbs of milk. That’s enough milk to make 150,000 pizzas a day! 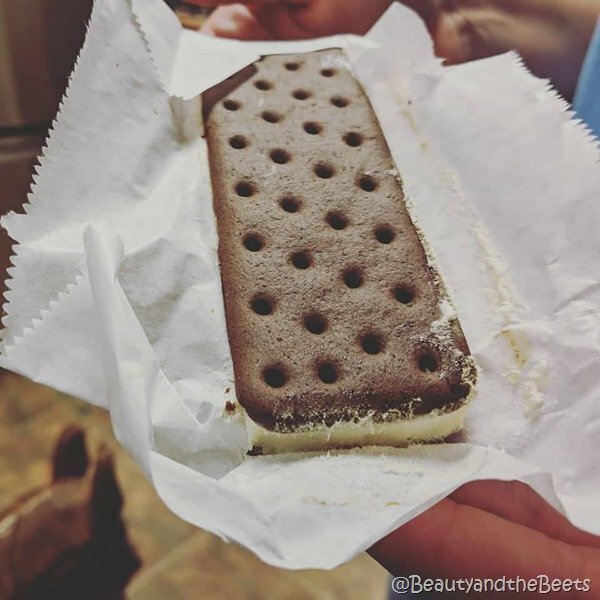 We met the dairy cows out in the fields before we snacked on ice cream sandwiches. 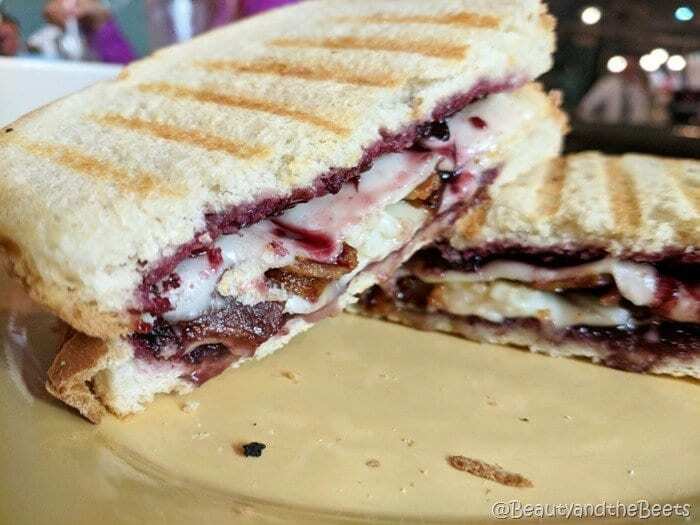 We ended the day of our #FarmFoodTour at The Crazy Mule, a restaurant in Greensburg, Kansas, where I loved my Blackberry Grilled Cheese sandwich. **This post is sponsored by Kansas State Farm Bureau and Kansas Soybean Commission. While I was compensated for my participation, all opinions are my own.